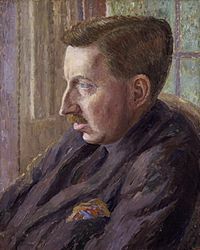 Edward Morgan Forster OM, CH (1 January 1879 - 7 June 1970) was a British writer. Forster was born in Marylebone, London. He attended Tonbridge School, an independent school in Tonbridge, Kent. He studied at Kings College, Cambridge. Forster was a homosexual and wrote about homosexuality, class division and gender. His novels include Where Angels Fear to Tread, The Longest Journey, A Room with a View, Howards End, A Passage to India and Maurice. He also wrote short stories, plays, essays, libretti and travel guides. Forster died of a stroke in Coventry, Warwickshire. E. M. Forster Facts for Kids. Kiddle Encyclopedia.